Great Baldwin Park opportunity to own this beautiful Spanish style 1-story on a quiet and picturesque residential loop with park views. This property won't last! It's about LOCATION, LOCATION, LOCATION! 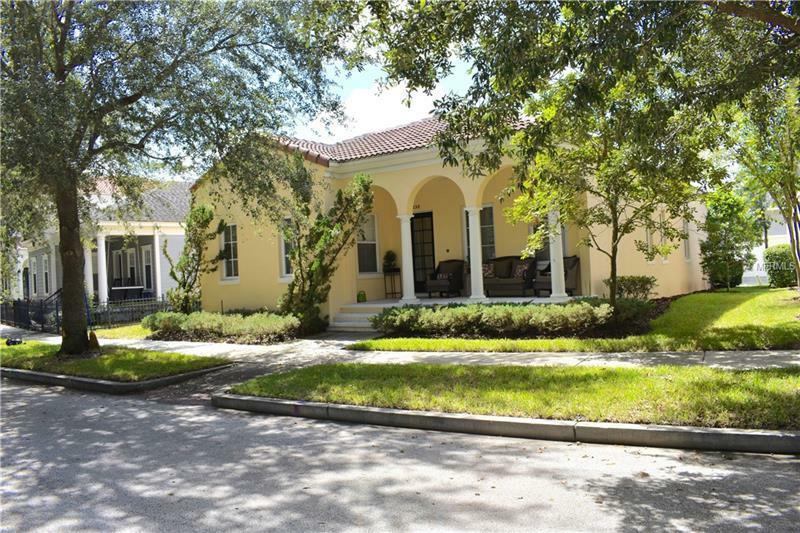 Popular Mediterranean style 1-story Cambridge Homes model with front covered porch that overlooks park. Large foyer opens into dining room area, leading to an open kitchen and family room. Home is a split plan with master bedroom in the front with volume ceilings and spacious walk-in configurable closet. Master bathroom has spacious walk-in shower with dual sinks. The two additional premium carpeted bedrooms are just beyond the family room. Beautiful hardwood floors, with crown moldings throughout, kitchen with granite countertops and stainless steel appliances, window plantation shutters, and many other upgrades. Utility room under air. The A/C unit (Trane) is only 3 years old, as well as newly replaced garage door motor. Two-car garage with alley entryway from the back. Tile roof means many years left, and home was also repainted within the past few years. Side porch is large for this model, and is over 10-feet across. Side yard is plenty of room for a pet or small garden. Short walk to Publix, CVS, restaurants, shops, pools, gym, playground, Lake Baldwin park, dog park and paths along Lake Susannah! Short drive to Winter Park, downtown Orlando, and UCF.